What is a canopy tour? 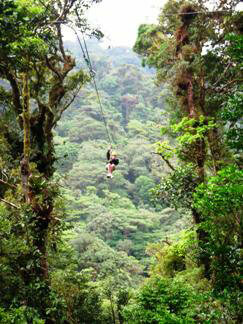 Who can do the canopy tour monteverde? Do you need experience? Is it safe? What is the minimum and maximum age? How fit do you need to be? What if I’m scared of heights? What if I weigh 250lbs? What should I wear? How long do they take? These are some of the questions asked by many a tourist! If you visit Costa Rica you will most certainly hear about the many canopy tours available. It is one of the most popular tours in Monteverde Costa Rica and other places many tourists try this activity for the first time in their lives. Even unadventurous visitors often get talked into doing this fun and exciting tour. So the term ‘canopy tour’ should be defined. The word ‘canopy’ describes the top of the forests. The ‘canopy tour’ refers most commonly to flying between the trees from platform to platform (or tree to tree), along suspended cables (zip lines) using special harnesses and equipment. Some people also call the Hanging Bridges, canopy tours; these are a series of trails and suspended bridges over and between the forest that you can walk on either on your own or with a guide. 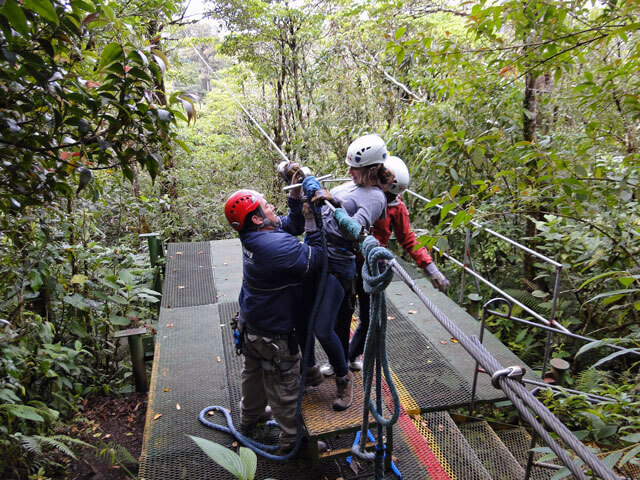 But this article really refers to ziplining and the canopy tour monteverde. The whole idea was started in this country in 1992 by Darren Hreniuk and his partner, Rick Graham who created a company called the Original Canopy Tour (that still operates today with different owners). The first canopy tour was in the forests of Monteverde. Darren’s goal was to provide a fun activity whilst helping to raise awareness of the Monteverde ecosystems and the environment. In the last 20 years the concept has grown from strength to strength. There are now canopy tours in many areas all over Costa Rica. It is hard to find a popular tourist destination without a canopy or two. In some areas such as Arenal and Monteverde there are as many as 6 companies! The other big change is the size, number of cables, heights and special extra activities of these competing companies. Many offer optional tours such as ‘tarzan swings’, repels, trams and even bungee jumping, so you can do ‘combo’ tour packages that last the whole day! Canopy tours are probably not the best activity for people with a major fear of heights although people with just a little apprehension often challenge themselves and come back to the hotel with a huge smile and a feeling of accomplishment. It is quite normal to be a little scared and nervous! But these nerves soon disappear after the first 1 or 2 cables. For some people it is possible to go tandem with a guide. Although the tour can exciting it is not the pure adrenaline feeling you would get from a bungee jump and the tour is certainly accessible for most fit and slightly adventurous people. The canopy zipline tour itself is about 2 hours plus transport time although exact timing depends on the number of people in your group. Also if you add another tour such as the hanging bridges to make it a combo, it will obviously take longer. The ziplines tours are suitable for all reasonably fit people, typically between the ages of about 8 and 70 (although ages ranges can vary from tour company to company). Although not too physically taxing you must be able to hike about 2 - 12 minutes between each platform with your equipment. There is a weight limit of about 230lbs (but this varies from company to company). The canopy tours in Monteverde are all considered safe, designed by engineers and endorsed by ICT (the Costa Rican Tourist Institute) and each tour has at least two guides at all times and you will be given instructions on how to brake and everything else needed to have a fun and safe time. 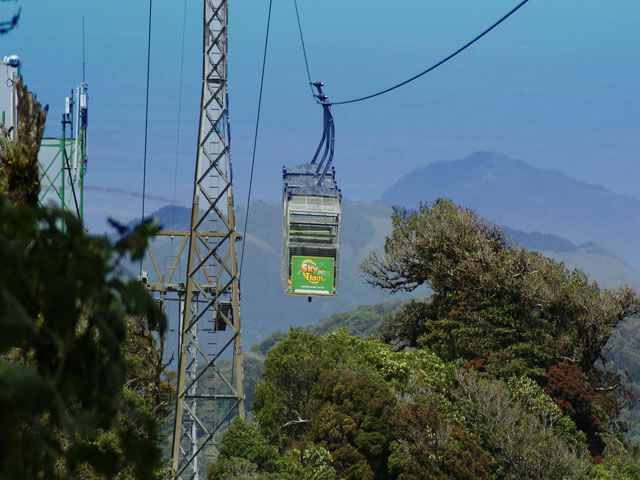 But if all this does not reassure you, no problem you can always check out the Monteverde Skytram (go up and down with a guide, no ziplining involved! Private parks such as Selvatura Park has many activities where you can ziplining but also tours on the hanging bridges, butterfly garden, insect exhibition, reptiles and hummingbirds. They have restaurants and transport and you can spend the day having lots of fun without worrying about getting from place to place. And finally.. what to wear? It is advisable to wea comfortable, light-weight long pants and enclosed shoes. Most canopy tours have lockers where you can store your stuff. Remember shorts ‘ride-up’ with a harness and you may show off more than you were intending to! Strapless sandals will simply fall off. Wear sunscreen and bring a light rain jacket (you never know!). 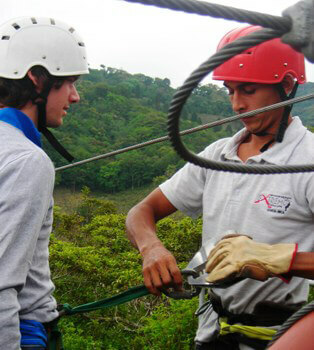 Read even more about Canopy Tour Monteverde.